Gives your horse the ability to kick while jumping. Assets from this mod may not be used for "for profit" work. 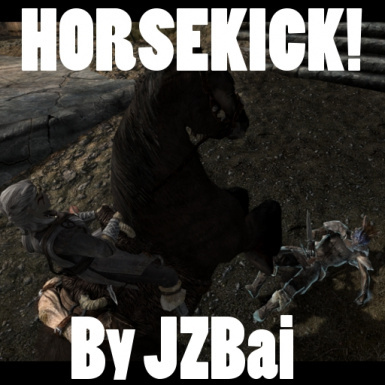 A simple mod that gives your horse an attack during its rear up and jump animations when you're riding it. press jump to trigger the rear up animation. Anything in front of your horse will be knocked down and eat a bit of damage. The kick won't knock down Dragons, Mammoths, and other large enemies, but will stagger them. Designed with compatibility in mind! It shouldn't conflict with any mod that modifies horses or their behaviors! Download and activate with Nexus Mod Manager or to manually install, extract the .esp into your Skyrim/Data folder and the scripts into your Skyrim/Data/Scripts folder. Then enable the esp. In game, you should see a message on load up that indicates the mod is activated. Source files for modification in the Creation Kit are packaged too, but optional to get the mod to work. A WORD TO THE WISE: Scripted mods are never easy to remove due to how save files and scripts work. I tried to make my mod as small and easy to manage as possible. I've experimented with uninstalling my own mod, reloaded the save and didn't see any problems or CTDs in my game, but I can't guarantee that your save file will be clean after installation! 3. Remove that spell from your character via "player.removespell <spell ID>"
Horse Kick was tested for compatibility with Convenient Horses, so it should have no compatibility issues whatsoever! The kick really complements the horse charge feature added by Convenient Horses and gives you a good mounted combat option to do damage and knockdown with your horse when you're not sprinting with horse charge. Not tested for compatibility, but the mod doesn't modify anything that Better Horses does so it should be compatible.